Single Phase 300Vac (Live/Hot to Neutral). Constant Sampling technique; misses very little data. Complete with Electrosoft energy analysis software and sealed to IP65/NEMA 12/4 as standard. 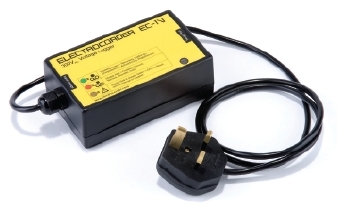 The Electrocorder range is designed to allow users to cost effectively monitor their voltage supply, the Electrocorder enables real voltage problems to be highlighted quickly for further investigation using traditional recorders. The EC-1V is widely used for Voltage optimisation justification, used for pre and post installation analysis. Setting up the Electrocorder is easy, suitable for non-technical staff. Using the supplied Windows software, Electrosoft; the customer's name and address are input to the unit's memory and stored. Electrosoft will print the necessary dispatch / return documentation including customer instructions. All data is included in a database of dispatches and returns. Memory modes available: The Electrocorder can be set to start recording when it is plugged in and stop recording when the memory is full. Recording is shown by a green light and completion by a red light. Why is the Electrocorder better than other similarly priced competitors? The Electrocorder range use a constant sampling technique, unlike the single reading of competitors. When the loggers start to record, they sample every channel 16 times per cycle, a cycle is 16ms at 60Hz and 20ms at 50Hz. At the end of each averaging period, 3 quantities are saved for each channel, the True RMS average, the Max, which is the highest cycle value during the period and the Min, lowest cycle value. This means that it will record all the peaks and troughs which are one cycle or longer. When recording the Electrocorder will store the average voltage over the period chosen (1 sec to 60 min), it will also record the highest (max) & lowest (min) cycle values during that period. When the unit has been returned to the power company, the stored data is uploaded to a PC via the supplied RS-232 cable. Using Electrosoft, the recorded voltage levels, dates & times can be viewed in both tabular and graphical form, exported to a spreadsheet or saved to file. Graphs can be printed showing the recorded levels and the allowable tolerance bands. These results may then be discussed with the customer. Electrosoft also provides an internal database which effectively manages the distribution of multiple units. The Electrocorder records voltage levels, shown by a flashing green light on the unit. A red light advises the customer the unit has completed recording. When finished the customer unplugs it and returns it to you in the reusable mailing case. Upload the data from the Electrocorder and analyse it using Electrosoft. From this you can generate a report on the results and discuss with your customer what further action is needed. There are many models of Electrocorders, single and three phase, voltage, current and both voltage and current. Voltage recorder enables real voltage problems to be high lighted quickly for further investigation. Allow engineers to quickly and cost effectively monitor & re solve possible supply problems. Small, safe & easy to use. Records average voltage, max & min with date & time & stores information in non volatile memory. Windows based software, Electrosoft. Kit includes Logger, Carry Case, Electrosoft software, & RS- 232 serial lead. Recorded data is uploaded to a PC for analysis with supplied free software. Electrosoft includes internal database to ensure effective management of distributed units. Selectable measurement resolution to suit each situation, accurate to ±1% of reading + 1 Volt (90 - 260Vac). Order code:- EC-1V-IP65-50-KIT (50Hz) or EC-1V-IP65-60-KIT (60Hz). Part numbers in this range include EC-1V-60-NA-IP65-KIT, EC-1V-50-UK-IP65-KIT, EC-1V-50-EU-IP65-KIT, EC-1V-50-SA-IP65-KIT, EC-1V-50-AZ-IP65-KIT, EC-1V-50-IP65-KIT and EC-1V-60-IP65-KIT.